Please take the time to browse our bargain page. The items here are all one-offs which, for whatever reason, have been reduced in price. Sometimes we just buy a heap of stock in cheap, some are orders someone left a deposit on and then decided they didn't want, etc. You get a full warranty as normal unless otherwise stated. Pictures are for example only (usually not photos of the actual item). Our price guarantee applies as always - if you find a cheaper price on an identical item, bring in a written quote and we will beat it. This is a particularly beautiful example of Ocean Wave Blue. 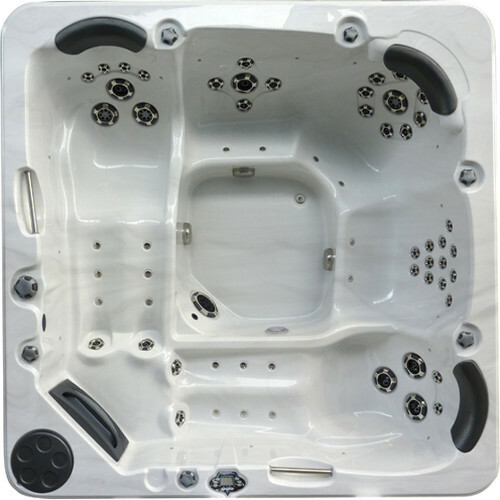 The spa is brand new display stock on our showroom floor. It is fitted with all the standard "Classic" model features, plus additional neck and shoulder jets that are not normally included. We would be happy to sell this one with the neck jets thrown in for free. Come in and try it out today!